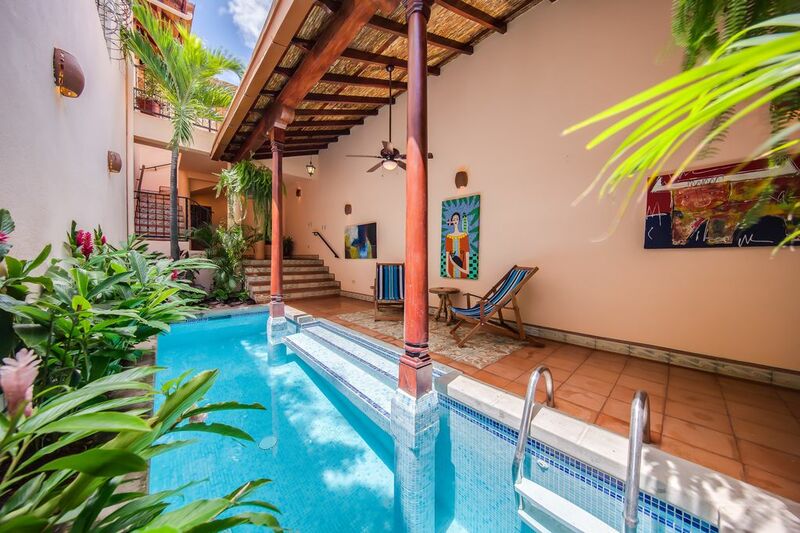 Spacious and charming colonial house with a pool in the center of old town Granada. This home is a quick 5-minute walk to Parque Central and less than a 10 minute walk to the lake. A mere block away, the shops and restaurants of the infamous Calle La Calzada abound. Inside, you’ll enjoy the open-air concept allowing for abundant light and breeze throughout. The deep swimming pool is surrounded by natural plants, right across from a covered seating area. It’s a relaxing oasis with exposed wooden beams, tile, and accent walls. This home features two spacious bedrooms, each with its own ensuite bathroom, and an additional half bathroom located poolside. Ice cold air conditioned and quiet bedrooms allow for a peaceful night sleep after a day in town or on the nearby hiking trails. Full maid service is provided throughout your stay. Airport pickup and meal service cooked in house options are available upon request. Excellent place to stay, close to Central Park, lots of shops and restaurants. Loved it! My wife, my two teenaged daughters and I stayed in this property for a week. It was very well suited to our family as the girls took the loft bedroom with 2 beds and full bath and we stayed downstairs with the queen bed and full bath. There is a small pool which was awesome to cool down in since it was very hot when we were there. We were in an excellent location to walk and see the sites of Granada, close to restaurants and shops and we could walk down to the lake. Grethel, the property manager, was super friendly and helpful in booking tours and recommending restaurants and returned calls and texts (on what's app) promptly. The place was clean and a maid came twice while we were there. We would definitely recommend this property and would stay here again! I spent just a week at Casa Carlota and I just wish I could have stayed longer. I plan to return to Granada again soon and have already asked if I could stay again! The house is spotless, has a fully functional kitchen, and the best shower EVER! There were laundry facilities on site (HUGE BONUS points!) and the property manager Grethel was there to greet me upon my arrival and answer all of my questions. Upon my departure she was there to ensure everything went smoothly. I honestly can’t say enough about this property and the staff. I always felt safe, bedrooms are in the back away from the street and I had a guest stay with me for the weekend who said it was the best night’s sleep since her arrival a month ago. I would be greatly disappointed if this property wasn’t available for my return to such a beautiful city! In fact, I may plan around their schedule! Thank you again for your hospitality. My family and I stayed in Casa Carlotta for 3 weeks and really enjoyed our stay. The home has two big bedrooms (one upstairs and one downstairs), both with AC and their own complete bathroom. The kitchen and living room are connected in an open concept design, with all the amenities needed to prepare your own meals. The home has great ventilation, with multiple ceiling fans and a full size pool that helps keep you cool during the warm afternoons. Also the second floor has an open patio with hammock that is great for relaxing or watching the stars in the evening. Some additional surprises included multiple wifi networks within the home for great connectivity, a half bath right beside the pool to wash up, alarm system with electrified fence to keep out the critters and complete washer AND dryer. What set this home apart from all others is the outstanding attention from all staff that cared for the property. Grethel, Yessenia, Oscar, and others were always available to answer any questions and resolve any issues as they came up. We cannot speak highly enough of this entire group. The location of the home is very central, one block away from Calle la Calzada, where all the shops and restaurants are located, minimizing the need for a car to get around. Overall, the time we spent in Granada was memorable and this was due in part to the fantastic property we stayed in. Some things to be aware of for those not used to life in Latin America is that a central location, while convenient is not relaxing or devoid of noise with the home located in close proximity to two churches and is a busy street for taxis and other traffic. While there are several mini markets that carry basic provisions, there are no grocery stores or markets withing walking distance, so it would be best to stock up on everything as you enter town, or flag down one of the many taxis that pass by during the day. Another thing is that home is truly open concept with the outside street and the home separated by only a 3/4 decorative wall, which adds to the noise, the dust/dirt and the critters that make their way inside. This is part of the design of the home, so make sure you keep all food items well stored in the fridge or pantry. Overall, the property was what we were looking for and conveniently located to enjoy the best of Granada. Looking forward to visiting again in the near future. Note that any reservations are inclusive of $50 of electricity usage per week. Any excessive charges above that may be deducted from the damage deposit.